placed near your mailbox on the 13th. 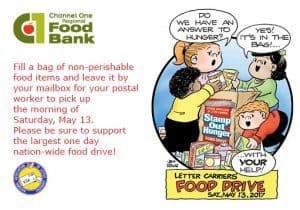 Letter carriers will collect the food left in or near mailboxes along their route, and the food collected will be distributed to local food banks, including Channel One, to help those struggling with food insecurity. Last year, the annual Stamp Out Hunger Food Drive collected 85,176 pounds of food for Olmsted County.